Colonial Beach is a small river town located about midway between Washington, D.C. and Richmond, Virginia at the northern tip of the Northern Neck — an area rich in history and natural beauty. During its heyday, Colonial Beach — known as the Playground on the Potomac, with the second largest public beach in Virginia — had shores crowded with casinos, fishing charters, hotels and restaurants. Today, remnants of the old piers remain and the pace has slowed, but you'll find plenty to do and see. 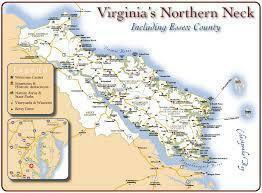 Part of the town is laid out on a peninsula between the Potomac River and Monroe Bay. Its relatively flat terrain provides a perfect place for a leisurely walk or bike ride. If you want to move around town a bit faster, golf carts are legal on the streets. The water views are calming, the architecture of some of the old houses and cottages is captivating and the sunsets on Monroe Bay rival any you've seen. You'll see (and hear!) Ospreys in the summer, be mesmerized by soaring Bald Eagles, and enjoy spotting a large variety of both water and woodland birds throughout the year. There are marinas for boaters, a 2-mile stretch of beach, fishing and picnic areas, friendly people and lots more…. Traveling outside Colonial Beach throughout the Northern Neck, you will be taken back in time to unspoiled landscapes steeped in history. As you explore the region, stop in at one of the many wineries, check out the parks and recreational areas ... listen to the quiet ... and enjoy roadways free of congestion. You may find yourself enjoying a visit that will bring you back again ... and again. An interesting article in the NYT Travel Section you might like to read: Virginia's Lost History. Listed below are informative sites about the region. We hope you'll choose to stay with us when you visit. We look forward to seeing you.